Bodhisattva,Bodhisattva Mukhopadhyay,bodhi,mischievous Bodhisattva,mischievous Bodhisattva for you. 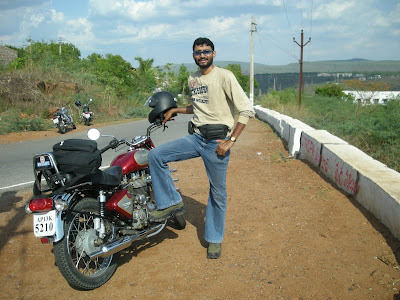 On May 26, 2008 Saturday, we went on an adventurous ride to Srisailum, a beautiful place on the Ghats which is about 220 Km from Hyderabad. The ride was organized by Wanderers-The Royal Enfield Fraternity of Hyderabad. It was a combined ride with the Highway Nawabs joining us in our quest for adventure. It was a ride which we were eagerly waiting for, so as to break free from our mundane monotonous lives and to play with the wind in the serene beauty of the Ghats. In the morning [6.30 AM] of 26th May the riders of the Biker’s club Wanderers met at James Street MMTS station along with the riders of The Highway Nawabs to take the trip to Srisailum. We were 34 men in 17 Bikes and a WW II jeep WILLY’s which we called Grandmother. At 8:00 AM we roared of with our bikes towards our destination. People of Hyderabad were sent aback with such a convoy of bikes riding in 2x2 formations with their engines thumping in a synchronous manner. Soon we passed through Charminar and Falaknuma Palace and off to the highway free from the pollution and traffic snarls of the crowded city. Nothing gave us so much pleasure than to put our bikes in top gear and press the throttle. We stopped at a place on the highway just to regroup and take snaps with our machines and decide where to take breakfast. After riding 80Km our first stop was at a place named Amangal to have our breakfast. It was already 10 AM and our stomach needed something to munch upon. The breakfast gave us the necessary energy to move forward. Since the weather was cloudy so the roads were less heated and it was a pleasure to zoom through them. Picturesque landscape welcomed us and people from villages waved at us as we drove through with our headlights on and occasional rhythmic honking. Some of the riders were falling back as there was a new baby with recently fitted bore and piston and it could not be pushed to limit. We stopped under a neem tree at Hazipur on Srisailum X road and waited for the baby and grandmother to arrive. The baby finally arrived with a big smile on its rider’s face. We started climbing the Ghats towards UmaMaheshwarSwami Temple. It was a steep climb and all of us enjoyed the ride. One of the bike’s cable snapped which was instantly repaired .The temple is situated on the hills and the road to the temple provides a wonderful view of the valley down under. Miles of barren farm lands lied under us and the sky looked down upon us as we rode through the Ghat road. Sunrays danced through the clouds and made the surrounding even more beautiful. The mandir was at the edge of a cliff and contained a beautifully carved deity carved out of stone. Our trip was covered by NTV a Telegu News channel and we were accompanied by a reporter and a cameraman. While the reporter rode in the Willy’s the cameraman was riding with Vardhaman as we rode by. The cameraman took footage of the whole trip including the one’s in which we rode in 2x2 formations. On our way back we were interviewed by the reporter amidst deep jungle. It was a real thrilling experience. We stopped at several places over the Srisailum road just to take pictures and enjoy the serene beauty of the Ghats and the reservoir of Srisailum dam which was visible from the top of the hills. The water in the dam had receded to a considerable level due to intense heat of the summer months. The hide and seek of the clouds and the sun gave a wonderful view of the hills with parts of the hill being shadowed and other parts being under direct sunlight. The formation of the cloud over the hills and the sunlight piercing them and falling over the hills was worth riding that far. We reached Srisailum at 5PM and boarded a guest house which was completely reserved for us. The parking got filled up with our bikes and we were eager to fill up our stomach with whatever was available. The food served was good and in ample quantity and since our stomach was crying for food it went down within minutes. It was then we tried to explore the surroundings. I found that the place had beautiful houses and the Mandir was just a few meters from the guest house. In the evening we went to the mandir to offer prayers and with help of Shrinu Anna we were able to offer prayers and view Shivlingam from a close range and even touched it to offer our prayers. 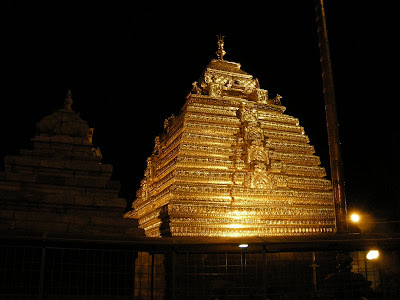 I took a few pictures of the main mandir whose dome is gold plated and shines like the sun when light falls over it. It was time to go back to the guest house and I went back with heartfelt admiration towards the craftsmen who built the magnificent structure so many centuries back. The walls of the mandir was carved of stone and every frame was engraved with events from ancient holy books and the carvings were so perfect that even today with advanced technology it will be hard to copy them. The outer periphery wall that surrounds the mandir had been built of same stone and had in them engraving of gods and goddess and also throws a light about the life of the period when it was built. The mandir has seen the ages and still it stands strong and beautiful. It is a jaw dropping beauty amidst dense jungle and overlooking the hills. Back to guest house we had a good chat with all fellow riders and some of them showed tricks with cards. The sky was star studded and the nearby hills were glittering with lights from houses and streetlamps. The chat with new found friends made us forget all worries, tension of work, tiredness of the long ride, and mundane monotonous lives that we are accustomed to. Dinner was served and the bed on the floor never felt so comfortable before, we all surrendered to sleep with memories of the ride still hovering on our subconscious minds. DAY 2: 25th May, Sunday. I was awakened by fellow riders at 5:30 AM and that was done just for fun. Unable to open my eyes due to lingering of sleep I went outside with reluctant steps with my tooth brush. Then I thanked God that I was awakened so early. The sun was just rising from the far away hills and the sight made me run to get my camera so that I don’t miss the opportunity. Running back with my camera I took a lot of pictures and I literally forgot that the toothbrush was in my mouth. I realized only when someone pointed it out when I asked him to take a picture of me with the background. The sunrays lit up the whole surrounding slowly and the light danced between the hills and the jungle, it mesmerized me. After having breakfast we started for the return journey at 9:15 AM. On our way we visited a mandir top of a hill named Nandi Shrikharam from where the golden structure of the Srisailum mandir was visible. There is a saying that if anyone is able to spot the golden top of the mandir he attains MUKTI or freedom. May be I had a lot of sins committed and hence the MUKTI was not close by. Riding downhill for half an hour we stopped at Gayatri Mata Temple, it was a relatively new structure but was fascinating. Crossing the dam we started riding through the Ghats and through the dense forest. The group had already got scattered since every one was riding at different speeds and didn’t prefer to stop at Gayatri Mata Temple. I had one bike in front of me and expected that a few will be riding behind mine. The bike in front was really riding hard and at one moment when I had to slow down to overtake a bus it went out of my site. The road through the forest had lots of mysterious twist and turns and hence it was not possible to see the tail light of the front bike. I cruised through the road and after almost riding more than half an hour with average speed of 60Km/Hr and occasionally touching 90 Km/Hr I found that I was the lonely rider over the road with traffic coming from the opposite direction. There was no bike in front or at my rear. Only thing I could hear was the thump of my engine and only visible mammal was monkeys which were sitting by the side of the road. A sudden fear gripped me and I slowed down a bit since I felt that I may have had lost my way and in such a dense forest it is not at all a very satisfying thing. Just then I saw the tail light of my front bike and started speeding up so as to come closer to it. The sight of the bike gave me a great relief, and as I closed in my confidence grew. After riding a while we saw other riders of our group waiting for us by the side of the road and we stopped. I could only hear the chirping of birds and the sound of the engines of passing bikes. As all the riders gathered the NTV crew interviewed us requesting us to enter the forest and we happily provided them the bytes. We were questioned about how we are enjoying the ride and what were the safety measures that we have had taken for such a long ride. 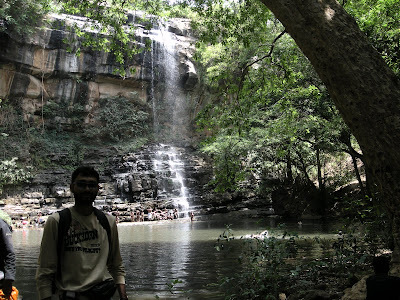 After riding for a few more Kms we reached the crossing of Mallela Theertam Waterfalls. It was 12.30 PM and we debated whether to have lunch and move on towards the waterfall or just forget lunch for the time being. The traveler within us decided against lunch and we felt a sudden adrenaline rush within us. We were eager to ride off road. The waterfall was 8 Kms from the crossing and the road was in a real bad shape. It was built of red stones and no tar was applied on it. The loose gravels made our rear tyre’s slip and our bikes swayed at times, but the joy of riding off road was immense. The road passed through ploughed fields with no sign of crops. We reached the entry of the waterfall from where we need to take 350 steps downwards through stairs to reach the base of the waterfall. As we climbed down the stairs we entered the jungle. It was dense forest and the sound of falling water was clearly audible. Moving towards the sound through the jungle we saw the waterfall emerging from behind the trees. The waterfall was almost 200ft in height. The water was cool and we had sweated a lot to reach it. It was difficult for all of us to resist the temptation to get into the falling water. So I got into it and the pleasure was such that I was inside the waterfall for more than an hour. Sometime the water was hurting as it was falling from a considerable height. But the pleasures overcome the pain. After spending a considerable time and taking a lot of pictures we rode back, it was 5:00Pm when we stopped at a Dhaba at Hazipur to have our lunch. We were dam hungry and whatever was served went down our throat. It was then the long ride back to Hyderabad. Once we lost our way and traveled 10KM in opposite direction but soon realized our mistake and took the correct path. The clouds were gathering and it started drizzling. I stopped to put on my raincoat but my pillion, the cameraman of NTV had no protection from the rain. Lightening struck the surrounding and it was a awesome view with the flash of the lightening lighting the whole area for seconds and then it was again dark. The view of the small highlands and the barren lands underneath it was fascinating in the flash of lightening. Just before entering Hyderabad we called up Lalit ji who owned the WILLY’s, he waited for us and guided us through the city road and the Charminar. Finally I reached home at 9:45 PM, exhausted but happy and content. The pleasure that we had and the benevolence and friendship we developed was worth taking the trip. It was a great feeling that our trusted friend, our bikes, didn’t let us down rather made us proud that we owned such an awesome machine.